Judging by the wonderful and creative responses we received, this is a common issue solo entrepreneurs must tackle, no matter how seasoned they are in business. The tips ranged from variations on list making, finding accountability partners, and maintaining a positive attitude, to getting things done for the love of delicious cuisine, chocolate and even shoes. If you have been struggling with your accountability lately, I hope that you will find a solution to implement from these great suggestions. They certainly got me thinking about new strategies I could try in my own business. Our sincere gratitude to the 72 entrepreneurs who were kind enough to post their stories. Openly sharing your expertise and experiences is a huge asset to this blog and the readership. I wish you all a wonderful week and hope to see you here again. One of the hardest challenges I used to face as a solopreneur was paying the bills. Finding the time to actually sit down and write all those checks, put them in envelopes, lick the stamp and get them off in the mail takes time I didn’t have. I decided I’d block an hour on my calendars on Fridays to pay the bills. Even doing that didn’t always help. Since I knew I am motivated by reward, I told myself that after bills were paid, I’d write myself a check for the week. That if I didn’t spend the time paying the bills, I couldn’t have a paycheck. It worked, since I wanted to get paid, I made sure I got all the bills sent out before writing my own check. Being a solo entrepreneur, in order for me to maintain my focus and stay on track with my goals/progress, I have an accountability partner. It’s easy to slack off when you do not have anyone to answer to. I found a like-minded entrepreneur and we decided to be each other’s accountability partner. We write out what we want to accomplish for the month and meet at the end of month to see if we completed our goals. If we do not complete our goals/tasks we have to pay a $50 fine. Needless to say, the pot is still empty. 3. Getting It All Done – My Way! Even though I am a solo entrepreneur, I run my business as a big company. I have a completely virtual staff, made up of professionals in the marketing area, which include writers, strategists, graphic & web designers and the best of all – virtual assistants. We have a team of gifted people who step in so I have ways to get all work done on time and with complete control of it all. I use a to-do list in my Outlook and start each day reviewing. I make sure I take care of what I can and then transfer what I don’t do to the next day. I also number them 1 – 10, showing what is of most importance, dated and this way no deadlines are missed. 1) Washing dishes could successfully convince me – even for a moment – that there was such a thing as closure. 2) If I write a list of all the things I need to do in the minutest detail and then, one by one, cross them off, I can get through any task. No matter how undesirable. In fact, particularly the undesirable ones – if for no other reason than I’m so happy to see them crossed off the list. One other thing: Write the list on paper. It doesn’t work as well online. The physical action of writing and then crossing off has its own satisfaction – but even better are the number of times (which are a lot!) that I revisit the list just to see those crossed off items. Then I smile! 5. In A Word: Deadlines! I am accountable to my clients, not just myself; one way I make sure I stay on track is to instill tight deadlines on myself to present work to my clients, submit their stories or press releases, send final copy to the art director, etc. Every project has a deadline and I make sure to keep them tight, but manageable. That way I get the work done (on time) and keep my clients happy because they see their projects are taking priority with me. I also stick to a daily to-do list which includes everything from phone calls to copy revisions and revise it daily, as needed. I refer to it constantly, it’s my road map. The energy released from having completed a difficult task sustains me for the rest of the day and makes everything that follows seem easy-to-do, by comparison. If the first-task-of-the-day was especially onerous, I will even go so far as rewarding myself before tackling the more-desirable tasks. When a stack of receipts are staring at me to be organized for expenses, it’s the last thing that I want to tackle as a small business owner. The one way I’ve found to incent myself with those undesirable tasks is to set a reward. For instance, I might be interested in purchasing an inspirational book such as Katie Couric’s The Best Advice I Ever Got: Lessons from Extraordinary Lives. When my expenses are done, I’ll give myself permission to click “Add to Cart” on Amazon. I spend most of my day at my desk, trying to get things done. 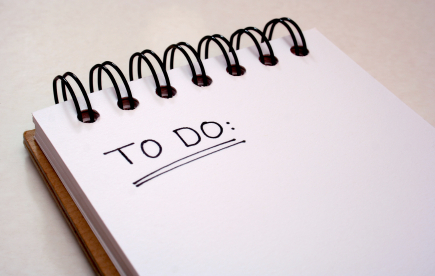 I’m pretty sure I’ll never reach the bottom of my to-do list — but there are things that have to get done. When I’m having a hard time motivating myself to complete a particular task, I find a way to reward myself for getting it done. If it’s something decidedly annoying, I might let myself watch a favorite movie after my work is done or set up a dinner out with my husband. Having a reward helps me avoid the feeling that all I ever do is the unfun parts of my work. My strategy for getting things done can be summed up by this: nothing else gets done until my business in-box is empty and all phone messages returned. Each morning at around 8 AM I deal with any questions or complaints on previous orders. No one with a problem wants to feel ignored. Then I respond to inquiries from prospective customers. Then I process the new orders so they are ready for carrier pickup. Once the priorities are taken care of, I deal with the rest of the email and check my personal email. I keep my business email open on the screen and respond as quickly as messages come in. That way, there is rarely a backlog. Customers have commented on how quickly I respond. Make a daily list of ”Things to Do”. Start with the undesirable tasks first. Yes, as crazy as this sounds it seems when I have a ton of stuff to accomplish and have all the time in the world it takes forever and I procrastinate. And when I have a place to go out of town, then I move the world. It’s all about creating tension or pressure, it moves the earth and it moves me. I make decisions faster, I get the job done in record time. Things become crystal clear and the priorities stand out. It works every time and is my winning formula. It’s like playing a game and a game has a time limit, 4 quarters, 2 hours whatever the measurement it is sure to get you movin’ and groovin’ on the task. A WIN for your team! When I am staring at the prospect of taking on disagreeable task, I imagine it as a physical “thing,” – a boulder, for example. I then imagine myself walking up to it, placing my hands on either side of it, and driving all of my energy into it so that it disintegrates before my eyes. I then imaging myself walking through the space that it once occupied. This gives me the impetus to get started. Then I immediately plan how I am going to reward myself when I’m done. Lately, French chocolate has served as my inspiration! A glass of champagne before dinner does wonders as well! – Why am I doing this task? – What will it create for my business? – How will it rock my clients’ world and thrill them? – How awesome will it be when it’s done? Sometimes I have to get a little creative with the answers… but this strategy of looking past the item on the to-do list to what’s going to happen when I complete it is pretty good for keeping me accountable, motivated and moving! When I was a retail sporting goods manager, my supervisor would always say “As a manager, if you’re doing the things you like to do, you’re probably doing the wrong things.” That was a reminder that being “the boss” often requires us to do the unpleasant and undesirable tasks, and if we don’t do them, the consequences can be staggering. I hold myself accountable by using look-up notes on my computer and I always See the Big Picture, or the goals I have. I think about the end result, and remind myself that if the day-to-day routines aren’t completed, I most likely won’t achieve the goals I am striving for. Often times I will reward myself for completing tasks (ie., an extra latte for completing a job). I have pictures of my family on my screen saver as a reminder of who I am working for! It is easy to get lazy and complacent. But when you work for yourself you cannot afford to be complacent. The onus is on you to get even the hard tasks done. One day when you are wildly successful you will be able to hire someone to do many of them for you. But let’s face it, there are always tasks in work that you have to do that you don’t want to do, otherwise it would not be work. Always keep your success in your mind. If you let the little things slip, you might just be letting your success slip. Sometimes you just have to buckle down and do it. I set a day of the week dedicated to doing tasks I don’t like to do. That way it is all done on one day and the rest of the week is devoted to the parts I like. Keep your success in mind and just get it done! Believe it or not, holding yourself accountable and moving forward with urgency, particularly while attempting to complete undesirable tasks, are the most important disciplines to conquer. So I suggest you begin each day by Eating the Big Green Frog. That would equate to finding the most undesirable task on your “to do” list each day and doing it first. Think about it; if you spend the whole day waiting to eat that frog, how much more difficult it becomes to eat. The frog only gets bigger, greener and more slimy the longer you wait. Yuck; why not go ahead and just do it, get past it, and use the momentum to move forward with ever greater determination. The rest of the tasks will be easy in comparison. Set your disciplines on achieving more and do it with urgency. You’ll surprise even yourself. When I am getting lazy and don’t want to do the tasks I dislike (finances), I make a to do list and stick to it every day. It is the only way to really keep track of all the work that has to get done and to not let the “fun” tasks fall by the waste side. 18. Promise Yourself A Latte! I’ve learned to place a time on my calendar to do the “undesirable tasks” followed by a treat or a little time for myself. Delayed gratification does work! Entrepreneurship can be an island existence, lacking opportunities to gain honest feedback from others. That’s why it’s critical that you give someone outside your business (whose opinion you respect) the permission to get in your face. Make clear that you want them to hold you accountable to what you say you want to do and who you claim you want to be. It can be a tough role, so choose wisely and listen well. Thanks to Clifford A. Bailey of TechSoft Systems, Inc.
My one best strategy for getting undesirable tasks done is to just do it. It may not be pleasant at the time, but I know it is good for business in the long run. So my philosophy is, just like medicine – swallow it! I run a media relations and marketing consulting business, which means I wear many hats – PR pitchman, copy writer, consultant, marketing strategist, you name it. I also use different billing models with clients, although most of the time clients are billed by the project or on retainer. However, I still use billable time to gauge productivity and accountability. A practice learned in my agency days, I keep track of how much time is allocated for each task for each client. Even though I don’t share the timesheets with the clients, using a billable time model helps me keep track of all activities, and I can use time allocated per client to gauge who is being over-serviced, which means it’s time to renegotiate the contract. It’s the best way to make sure time is money. As a busy mom of 3 and a Solopreneur, I would not survive without my to-do lists! To keep myself on task, I set goals and make myself “earn” free time. For example, after I complete 3 things on my list, I can take a lunch break. Or if I complete all the things on my list before a certain time, I can take an hour off to sit by the pool and read. Beating yourself up for procrastinating does not inspire motivation. It much nicer to “earn” a pedicure! As an independent contractor, I use Google Calendar to schedule all my daily and weekly tasks, just as if I worked at a company. I leave my calendar open all day as I work from home, and I see reminders about tasks that I need to complete. That way, no task gets overlooked, I keep up with my deadlines and make sure even the projects I am not eager to work on get done. 24. Are We There Yet? Are We There Yet? The only thing in the world that has more energy, or can be more annoying, than my six-year-old is his four-year-old brother. So I have harnessed their energy to help me in my endeavors. If and when we achieve my goals for the business we will go to Disney. Could you tell a six and a four-year-old they aren’t going to see Mickey because you didn’t do what you needed to? That there is no vacation because you didn’t finish your job? Believe me, they ask EVERY DAY if I have reached my goal yet. Annoying, and utterly effective as motivation. 25. Get ‘Er Done With A Sweet Reward! When I have a very challenging task, I do it first thing in the day to get it over with and reward myself with a piece of chocolate. Self-discipline is the hardest task for solo-preneurs. My best secret is to make a short list (not the long to-do) of 3-5 tasks that must be accomplished for the next day. First thing in the office is to review the list and the schedule and determine when those tasks will be completed. Check them off as they are done. Last item of the day is to make tomorrow’s list. Simple, straightforward and effective! As an entrepreneur, I have learned the key to holding yourself accountable is measuring how you utilize time. Time is the one commodity you cannot get back, so utilizing it effectively to achieve your goals is crucial. I set my daily schedule on both my day planner and my phone. I set the alarm on my phone to remind me that it is time to go on to the next plan of the day. I make sure that the day starts with the things that require the most attention — high priority order. Then I wind the day down to doing the daily clean up with the things that are not date/time sensitive. Make sure you use your time wisely! My best strategy for attacking “business” tasks instead of doing what I want is to keep in touch with a close friend who’s also an entrepreneur. We’re in fields that are only tangentially related, but there are still enough commonalities that we speak the same language and share the same fears. While I might be happy to spend the day on parts of the job that I enjoy, he’ll call me up at least once a week and ask, “So what’s your next step in your financial plan?” Sigh. Back to business! Having another entrepreneur – especially a friend – who will keep me accountable has definitely helped ensure the undesirable tasks get done. I allow myself one day of the week, typically Friday to leave work early, go in late or take our employees to lunch on a whim. Giving myself one “fun” day a week is enough of a perk for me to stay motivated the rest of the time while still enjoying the benefit of being my own boss. 3) I then just start at the top of each list, and I JUST DO THEM! ALWAYS REMEMBER: The way out, is thru, NOT around. Nothing goes away by itself – I make it go away! I make it happen! And the sooner I do it, the sooner the universe will cooperate with me and then I can move forward from there! Starting out as a solopreneur 3 years ago involved extreme discipline. The team was me, myself and I as I looked into the mirror. What kept me on target were goals. The goals were broken down into small chunks that I could achieve each day or week. The time was set aside to accomplish those goals and the discipline to know the end result I wanted. Also, having someone else to be accountable to each week. You will often excuse yourself, however when someone else keeps you on track – you make it happen. When faced with task that I don’t like to do, I schedule it into my schedule so it will get done. I hate filing, but filing is a necessary evil. Scheduling the task gets me ready for it and it will get done. To me the most important accountability standard is simply treating your business like a business, acting just as you would act if a boss were watching. Personally, I’m up early and start working around 6:00 AM. The next three hours are often the most productive since I’m usually uninterrupted. Then I break for about a half hour for breakfast at 9:00 AM and break again at 1:45 for lunch. I usually stop whenever I’ve got a good stopping point around 6 PM. As a solo entrepreneur I am challenged daily to stay on point to get my work done. I have discovered that offering myself a prize for getting a task done works. For example, if I have a piece of jewelry to make, I will design and create the piece and then allow myself to have coffee with a friend as a break. Knowing I am going to have some company lets me finish my job happily. I also make priority lists. Each time I finish a task on my list I do something like exercise to celebrate having finished a chore. I also make lists that are manageable so that I know that I can finish all the jobs on it in a workday. As a solopreneur, I know that I am responsible for getting the work done (A) ASAP and (B) Right the first time. As Yoda said, “there is no try, only do!” Since I am a perfectionist, I promise myself small rewards for doing the things I like least to do first. Rewards such a walk or run in the sunshine, a call to a friend, a glass of ice-cold Crystal Light. These treats may sound unexciting to the rest of the work world, but for me it is the small things in life that are the most enjoyable and that add to a perfect work day. I was living by my mantra of Do It Now long before Nike was in business. When you are the boss and have no one to answer to but yourself, there are times when you have to get things done that you dread having to do. One of those things is managing your credit risk, and dealing with customers that pay late or don’t pay at all. One strategy to hold yourself accountable is to keep the lines of communication open with those customers and call or visit them as soon as they are just a little bit past due. If you keep in mind that your cash is your biggest asset, that will motivate you to keep the cash coming in – resulting in you taking maybe one day a week to deal with the accounts that have fallen behind. If you can’t pay your bills on time, your business will suffer and that will hold you accountable! Maybe that’s why I am on my 4th book thus far! 38. No Meals Until You’re Done! My best strategy to get things done and holding myself accountable has to do with something I love: food. First, I break each and every day into two parts: what I get done before lunch and what I get done before dinner. So my rule is that I can’t eat lunch or dinner if I have not done what I set out to do for that portion of the day. I enjoy food and have always lived and worked in cities with great cuisine, so this is great motivation for me. My tip for others is to figure out what you like or enjoy outside of work, and then set priorities and the accomplishment of your goals around that. We all know how hard it is to stay motivated especially when you are doing it alone. Just like with losing weight, I recruited an “Accountability Partner”. A sole entrepreneur herself (different field), we are each other’s first phone call of the morning and last phone call at night. We keep each other motivated, on track and focused. Don’t do it alone! I think most of us have a tendency to do the things we enjoy first and save the things we hate to do for last. All day long those tasks are hanging over your head. At the start of each day, set aside uninterrupted time to address and take care of all of the undesirable personal and business tasks that are outstanding, the things you least enjoy doing. That way, the rest of your day can be much more productive and enjoyable knowing you don’t have those outstanding issues hanging over you all day. My single best strategy for holding myself accountable is writing a weekly to-do list. I review this list about mid-week to check off tasks that I have completed and to focus my efforts on things I still need to get done. The number one thing here is to focus on the outcome. Why am I doing this? It is hard to be an owner of a business, especially when you are starting out, and have no one to delegate to. If you don’t have a big enough “why,” you are going to flounder and procrastinate when the going gets tough. 43. A Great Coach Must Have A Great Coach, Too! I learned early on in my business start-up the best strategy to create personal accountability as a solo entrepreneur – hire another great coach! We can lament all we want about self-discipline, but there is nothing like asking another professional, a colleague, to hold your feet to the fire so you get great coaching results for your clients. It’s tough, but it’s the best way to ensure personal accountability in a solo practice coaching business. Swallow your pride, learn from the best! 44. Is It Important? Is It Urgent? 4. Not Important, not Urgent. Sort all tasks, and you will see that often tasks in category 4 are fun, or really easy, so are great for procrastination. Treat them as “candy,” but don’t let them take over your day. You might feel a lot of pressure from stuff that is urgent but not really important. If it distracts too much, let it go: It’s not important. And then, there is the relationship between the two “Important” categories: issues start in the “important, not urgent” box and, if you don’t take care of them, move to be “important and urgent”. First empty the “important and urgent” box, but also work on “important, not urgent” tasks, or they become urgent. I have been a solopreneur many times over. I believe one can be held accountable by simply utilizing his peers as administration. More specifically, tell your friends and family of your goals (i.e. launch website by June 15th or submit a proposal to client by May 31st) and you will be motivated to achieve them. The last thing you want your judgemental peers to think is badly of you – so be on time, create quality work, and show it to those around you! When I’m serious about reaching a specific goal in my business, I tell everyone. I write about it in my ezine, I announce it in social media, I share it with my mastermind partners, clients and colleagues. Saying it aloud makes it more real. The more I say it, the more confident I feel that I will accomplish the goal. I only tell people who will support me because I have enough Inner Gremlins without the help of additional negative input. My best strategy is to carve out a certain amount of time, whether it’s an hour or two, and work only on your action list. I’ll even get out of my office with all of the distractions and go to a coffee shop and work on my laptop. I find that I’m very productive during this window of time and get lots done! I end up getting tons more done than if I sat in my office with so many other “to do” lists staring at me. I also work out of a home studio so there is always something there that needs attention. If a person is so inclined to start up a business from scratch, chances are he/she is not prone to laziness. Back in the day, prior to when I had ventured into my entrepreneurial career, I recall being less inclined to get things done when my higher-ups were harping on me to accomplish tasks. Now, however, when things need to get done that I feel will benefit the business, I’m extremely motivated – even without someone to answer to! I love to do things that I feel will genuinely grow the business and I never shy away from a task at hand or lose focus when that is the case. Entrepreneurs and business owners become their own boss often because they don’t work very well with a boss. The very structure of the business model makes them accountable and successful! 49. It’s Off To Work We Go! To create a productive work environment, I prepare for work just as if I’m getting in the car and driving there. I have regularly scheduled work hours, and I arrive and leave on time. I do not take personal calls during work hours, but I do take an hour off to eat lunch, put in a load of laundry, and relax. The key is to stay in the office during work hours, so I don’t get distracted by things that need doing around the house. 50. Sometimes You Really Have To BE The Boss! Even when you love your work, there will inevitably be parts of the job you won’t love doing. When you are your own boss and can set (and re-set) priorities at will, it’s way too easy to keep back burner-ing tasks you don’t like or are less good at handling. That’s when you have to sit yourself down and really BE your own boss. Identify which of your procrastinated projects are mandatory and then set and stick to a timeline for completing them. Make yourself take care of issues relating to those projects first until you can check them off your list. And learn from that experience! If you can avoid taking on the same type of project again, do it!! 51. Set It And I Won’t Forget It! I put all of my important tasks on my calendar. I can then see how each task relates to each other. I can actually see that I can’t procrastinate on one thing without it affecting another. In addition to that, I can’t say I don’t have time. It’s on the calendar. I’ve already made time for it. Neither can I forget. I look at my calendar everyday. When I study people who are wildly successful, one trait comes to mind when describing them vs. everybody else – they are disciplined in a way most of us aren’t. “Discipline” conjures up all kinds of responses from me and none are good. I’m not, I don’t want to be, it’s boring… I have a belief that discipline is painful. And I know that with a little discipline I could make a lot more $$ and have more freedom. So how does the discipline-challenged get some? For me it’s easy: lose the word. I hate discipline, but I am a total creature of habit. So rather than changing my lifestyle to be disciplined, I need to create new habits. My top 3: Wine only with dinner, read 30 min/night, phones calls before emails. That’s my strategy – don’t be disciplined. Build great habits. Being an entrepreneur, you are ultimately the only one that is held accountable for any blunders or problems that arise at your company. Even though you may outsource certain aspects of your business or higher contract workers to finish designated tasks, you will always have the last say in the final product. A great strategy to use is creating a “To-Do” list. This list should focus on holding yourself accountable by working on your tasks in a prioritized sequence, and not haphazardly. Next to each task you should put the end goal or desired result that the task is geared towards. This way, you can remain goal-oriented rather than process-oriented by just checking off tasks. You only have yourself to answer to, but remaining focused on your goals will help you get through mundane tasks. On those days when I have to get things done, especially those things that are less than fun, I remember an odd saying that goes something like this. If you eat a live frog first thing in the morning the rest of your day is easy. This reminds me that it is best to tackle the unpleasant tasks first. I also reward myself for getting them done. My single best strategy as a solo entrepreneur is to tackle my undesirable tasks on the same day, my Day of Discipline. For that day, I get up very early, have a good workout and breakfast, make a REALISTIC task check-off list and begin. I find that checking things off is a necessary motivational tool for holding myself accountable for completing those not-so-fun tasks. It helps to keep me focused and I find that each checked-off item energizes me to get through the next thing on the list. Quite frankly, it’s these “days of discipline” that make me feel at my most productive. It’s important to have realistic goals for the day, ones that you can actually complete in the time allotted, as having a sense of completion is very important for making this strategy work. When I get through the list, I’m done for the day and try to reward myself in some fashion. Several years ago I decided I wanted to try running a website to make some extra money. For years I ran my website as best I could, at times making good money and at times making little money. The Internet offers lots of opportunities for making money. And lots of challenges. Recently during one of my dry spells, I thought about how I could make my website more profitable on a consistent basis. Then it came to me – if wanted my website to be a real business, then I needed to treat it like a real business, instead of just a website. So I wrote out a list of all the tasks that were most profitable, put them in order of importance, and started doing them every week. And in a short time my business improved dramatically. Less desirable and difficult tasks are the last ones attempted by most. The single best strategy for me is to start each day with a ritual and create a plan. My ritual consists of going through a motivational sequence I call my “I am’s”: I look in a mirror and tell myself aloud who I will have to be to get everything done. While listening to motivational music I create/review a to-do list. I print three copies as a visual stimulant: one for my desk, one for the bulletin board, and one for my briefcase. As I complete each task, I check it off. The least desirable tasks I accomplish first, while poised with motivation. I call it “eating the frog” because doing them can be hard to swallow. I measure progress against a plan as an effective strategy to get things done and self-accountability. 59. You Can’t Improve What You Don’t Measure! 2. Implement structures to hold yourself accountable. For instance, Sunday night, outline your goals and deliverables for the week. At the end of the week, score how well you did. And keep track of the weekly scores in a plot or graph. We all like to get good “grades”! You can’t improve what you don’t measure. That holds true of accountability too! I can keep a to-do list running way longer than it needs to be. When I don’t complete the task today, I push it back to tomorrow. What works for me is actually putting the task on my calendar at an appointed time. When the task is complete and my day is done, I can look at my results from that day. What’s my incentive to keep going? I decided to reward myself with mid-day treats. It is really simple. My incentives can be an activity I wanted to do and never do. I choose the middle of the day for movies, manicure, museum trip, or a trip to nowhere. Just anything I have not made the time for in my schedule. It makes completing the task so much sweeter. At the end of the list, I’m more productive, closer to my goal and had fun along the way. 61. If It Weren’t For The Last Minute, I Wouldn’t Get Anything Done! As the head of my own leadership development and team building consulting firm, I can readily identify with the sentiment expressed in the title of this post. However, when I feel like putting things off, I remember another quote: “Putting off an easy thing makes it hard. Putting off a hard thing makes it impossible.” I know that putting off undesirable tasks may provide a temporary respite but will inevitably lead to regret. The notion that procrastination makes easy tasks hard and hard tasks impossible resonates strongly with me every time I’m tempted to put something off. I also remember how I kept putting off my doctoral dissertation until the project threatened to overwhelm me. Not an experience I wish to repeat! 62. Cake First, Then The Frosting. Fortunate for me and my personality, I’m a eat-the-cake-first then the-frosting kind of person. Somewhat funny is that many, many times getting things done is a challenge. I’m a single mother and this, along with my business, make for a very full day. In regard to undesirable tasks, I have this head game I play and it’s the whole carrot and the stick strategy. First, I do this, then I get that (cake…frosting). I use doing things with my child, like taking her out for a bike ride, going to the library, doing a puzzle, etc., but first I have to return these calls, send these emails, write this blog post. The wonderful thing is that my child is in on it too and cheers, “Go mommy go!” (seriously, it’s funny and I’m so grateful that she understands, especially since she’s only 5). My best tip for staying accountable as an entrepreneur is to use various planning tools to measure success and keep on track. I still LOVE the Franklin/Covey planning system and incorporate that with some of my own methods and techniques. I also find it helps to have an accountability partner who you check in with weekly to make sure you’ve accomplished your projects and goals. My single best strategy for keeping on task and accountable is preparing a daily Punch List detailing the items that need to be achieved for the day. It can range from items relating to my work (“Follow up on Roza’s inquiry re: PR kit status”) to the mundane (“Change the cat box already!”). Nothing on the Punch List is unreasonable to achieve within my available time and I leave room to be flexible if something urgent arises. 65. Advisory Team To The Rescue! Being a solo entrepreneur can be the loneliest job in the world! You don’t have anyone with whom to discuss ideas or ask questions. Family and friends do not count! Why not set up your own Advisory Team made up of other entrepreneurs who have similar clients, but who are not in competition with you? This group would know some of your marketing problems because they are marketing to the same crowd. What would be a better group to talk with at least once a week for support and ideas? You could even set up a system to hold each other accountable for the action steps that you need to do for your business. If set up right, the members would develop such a devotion to the team that they would do anything not to let the team down. Before you leave the office identify and write down the main 5 tasks to be taken care of the next day. The next day turn off your phone and put a ‘genius at work’ sign in your door and get those 5 items taken care of. It’s simple, cost-effective and your productivity will soar. Account-ability is the ability to account (to identify and acknowledge) “what is now” – the truth of the current situation – and your part in it being that way (the choices and actions you took or didn’t take). Respons-ibility is the ability to respond to what is, a way that creates greater value. Hence, The Central Question of life love, and leadership (including self) is: “What choice can I make and action can I take, in this moment, to create the greatest net value?” Deliberately asking this question whenever we are procrastinating, overwhelmed, upset, conflicted, confronted, confused, uncertain, fearful, or filled with self-doubt can be highly transformational and helps us to access our greater strengths, rather than compensate for weaknesses. Because mom won’t always be wagging her finger at me when I don’t finish a presentation, I know I have to rely on myself to complete my daily tasks. So the first thing I do after rolling out of bed is make a to-do list. The hard stuff? Always at the top. Why? Because I know I’ll get to the easy things first, but having two ugly blotches of responsibility at the top of my list is great incentive to cross them off. Thanks to Ilana Jacqueline of About Time Media, LLC. I create daily and weekly lists of all the things that need to be done in my business. The fun things, and the not-so-fun items. Then I block out ½ hour, set the egg timer, and get focused and to work on those less-than-fun tasks. Before long, I’m racing against the timer to see how much of the task I can finish in that half hour. The trick is, when the timer goes off you must stop. No matter how involved you are in the task. Otherwise, the next time you try to do this, some part of you won’t believe you that you will stop in the ½ hour timeframe, so you must keep this commitment to yourself. You can do another ½ hour later in the day if you want to, but you must stop when the bell goes off. The best primer I read on Time Management was by the late great Brian Tracy, and his saying, “Inch by inch it’s a cinch, whereas by the yard it’s hard”, helps me get through the undesirable tasks by chipping away at them a little at a time. I create tiny deliverables and then reward myself with easy and/or enjoyable tasks in between, so by the end of the day I feel like I’ve accomplished a tremendous variety of tasks. Otherwise if you get bogged down on a task you hate doing, and view it as a single large task with no sense of accomplishment between the start and finish, it creates a vicious cycle of negative reinforcement. Thanks to Tom Steele of Information Engineering, Inc. When things get tough and I feel myself about to slack off or give up, I remind myself of who ELSE I am doing this for. I have four sons, and I would like to leave behind a legacy for my children to pass on to their children, and not just a life insurance policy. My kids are my inspiration and what keeps me going. I’ve found that no matter what strategies I try to keep myself on track, the key to making them work is to simply stay positive. And yes, this takes effort at times… read something inspirational to start your day, repeat some affirmations, get some exercise, network with some ambitious folk. Simply be mindful of when your thoughts start to veer south and steer them back in line by consciously employing positive thoughts. This can work wonders on your energy and momentum and empower you to focus and complete your tasks. This entry was written by Dr. Shannon Reece, posted on May 30, 2011 at 5:00 am, filed under Question of the Week and tagged accountability strategies, entrepreneur, holding yourself accountable, personal accountability, procrastination, question of the week, startups, strategies for women. Bookmark the permalink. Follow any comments here with the RSS feed for this post. Post a comment or leave a trackback: Trackback URL. Take Responsibility and Gain Power and Control! I thought this was an indispensible accumulation of insights from so many experts, some of whom I am pleased to know! My biggest mentoring comment to clients is to TAKE FULL RESPONSIBILITY for what you do…relish in the accomplishments and glory…and take the hit then quickly re-group when results are less than desirable. When we stop making excuses, when we pony-up, we can become conscious of how to repeat successes and avoid repeating losses. Awareness and personal accountably are critical to your success–and also that of your team. If you make this a new way of living and working, you’ll gain enormous respect for yourself. At the same time, other’s will gain more respect for you. It all accumulates into greater self-esteem, confidence, courage and ultimately business-success and profits. I am greatly thrilled by the wonderful resource you have given me for free. It contains the valuable information one would hardly give it away for free. May God bless you richly! Leslie (#4) nailed it right on the head, word for word! So glad you found one that was meaningful from all the great tips! Thanks for reading! Thank you so much for these tips! The hardest thing I do everyday is START…once I make the decision to get started, I plow through. A new goal for me is to finish my MUST do list by noon each day, rest two hours, spend the afternoon sorting, planning for tomorrow and filing. This is a race to the finish each day. Also, I recommend a book I read: “Never check E-Mail in the mornings!”..very helpful. Great post! I love chunky lists like this because they really provide so much to think about, other options, inspiration … just so much! Thank you very much Dr. Reece for the privilege of being included once again – always, we’re very grateful! Wishing you and yours a safe, memorable Memorial Day! Elena, Thank you so much for letting me know your thoughts about this post. 🙂 It’s such fun for me to see all the amazing responses, and we are thrilled to have yours this week too. Our hope is that everyone who reads this will find a nugget of inspiration or new tip to assist them right where they are in their business. Have a safe and happy Memorial Day too!